What Is My Eye And Face Shape, Please? I love your pages! I've looked at all of the eye shape questions and pictures on the site, and you are right. All women have different eye shapes and looks from each other (but all beautiful!). Oh Kristina:), I think you're selling yourself short! 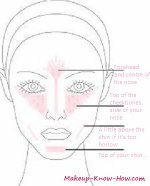 Let's start with your face shape, It leans more towards a hybrid between a heart, and square face rather than long. The length is not too exaggerated compared to the width. The eyes do seem small, but wide set in the picture. For eyebrow shaping(2nd picture), a soft, slightly round shape instead of an angle will complement your heart trait, while definition and slight thickness grounds the square aspect. I'd say practice by brushing into the shape you want, then draw markers where you need to first. That way you can see beforehand if you have the symmetry right.